Britain will get personal insight into the life of Elvis Presley™, the King of Rock ‘n’ Roll™, through the largest Elvis™ retrospective ever mounted in Europe, Elvis at The O2: The Exhibition of His Life. Opening at The O2, London on 12 December, the nine month exhibition will showcase over 300 artifacts direct from the Presley family’s treasured Graceland Archives, some of which have never been exhibited outside of Graceland in Memphis. Tickets go on sale at 9am on Friday 7 November 2014 (pre-sale from Wednesday 5 November). Elvis at The O2: The Exhibition of His Life chronicles the rise of the rock ‘n’ roll icon and how Elvis impacted popular culture around the world through his music, movies and personal style. From his humble beginnings to his meteoric rise to fame, the exhibition will explore Elvis mania that first swept America and then the world, ground-breaking recording sessions, record-breaking concert tours, his military service, Hollywood film career and influence on fashion. Most importantly, visitors will get an intimate peek behind the gates of Graceland and come to know the man hailed as the King of Rock ‘n’ Roll, who strived to be the best possible, father, son and friend. As a companion to Elvis at The O2: The Exhibition of His Life, the largest Elvis themed retail outlet ever assembled in Europe will serve as a marketplace for a large variety of Elvis and Graceland merchandise, including a broad selection of Elvis Presley CD’s and box sets from RCA/Legacy Recordings, including an exclusive Limited Edition 2-CD keepsake collection, The Music From Elvis At The O2, made specifically for this Exhibition and only available with ticket purchase or at the O2 Exhibition retail outlet. 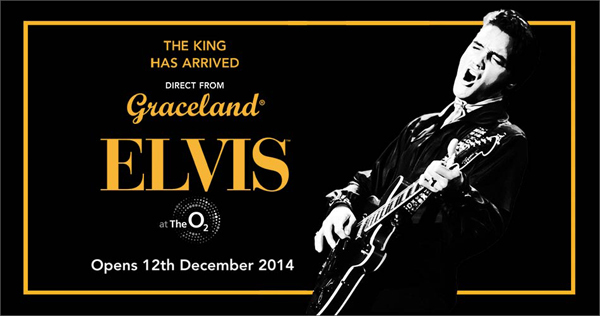 For more information about the exhibition, visit ElvisAtTheO2.com.